UNDER CONSTRUCTIONTimbertop Farm is a naturally grown shiitake mushroom farm located just out side of Ashland City Tennessee. 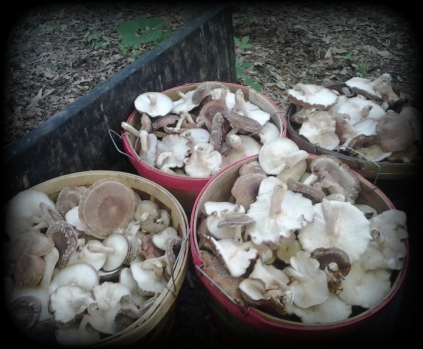 We have been farming shiitake mushrooms for 14 years selling our bounty to local restaurants and farmers markets. Our mushrooms are grown on premium oak wood. We chose the name Timbertop because we often acquire tree tops from newly harvested trees from our local logging industry. The tops of trees are considered a waste product by the industry, by harvesting these tops we are taking a waste product and converting them into a viable food source, a source that not only taste good but also a food that is considered a "Mega Food" because of it nutritional and medicinal values. Timbertop Farm supports practical conservation by striving to resource our farms production and sales needs locally first. We avoid harmful insecticides, herbicides and fungicides embracing the Bio Dynamic farming methods. We strive to be good stewards of our land and of our local community being thankful for the our given place.